… during the first week of November. By the time Halloween rolls around, I’ve forgotten them all and don’t want to shell out a ridiculous amount of cash on a crappy ready-made costume I’ll wear once. Luckily, I have no shortage of last-minute inspiration this year: I work in an office filled with insanely creative, thrifty folks who’ve put together some of the best darn DIY costumes I’ve ever seen. Did I mention none of them cost more than $30? To help you rustle up your own Halloween costume on the cheap (and, admittedly, just to show off), a few Penny Hoarders decided to share the DIY ensembles they’ll wear this year. And we’re sure you’ll agree: They. Are. Awesome. No “I’m going as my own twin” cop-outs here. Plus, since their components are thrifted, borrowed, closet-sourced or otherwise scrounged, they’re super cheap — and made up, in large part, of pieces you’ll actually wear again. That’s what we call a Hallo-win. So without further ado, here are seven of our team’s frugal, frightful getups and exactly how much (or little) they paid for them. Web producer Carrie Nowlin put together a costume some people pay more than $30 for — on sale. She borrowed the toy lightsaber from a friend with kids, but you can get one on Amazon for less than $10. Nowlin notes that a lot of people probably already own this sort of belt, which would make the costume even cheaper. She wasn’t positive the black overshirt would work; with its laced front, it initially looked more suited to a pirate costume. “But I figured, well, it’s two dollars, so if it doesn’t work, it’s OK,” she said. As you can see, after a little bit of reimagining and scissor work, the result is perfect. Apparently you can actually spend a thousand — a THOUSAND! — dollars on this costume. Thank goodness we’re crafty, right? Graphic design intern Kristy Gaunt was one of the first to sign up when we decided to create this post — and for good reason. She and her mom have been making their own Halloween costumes her whole life. “I think we only bought actual costumes once or twice when I was younger,” she said. That old adage is right: Practice makes perfect. Since Gaunt’s created looks ranging from Lady Gaga (there was a disco ball involved) to Sally from “The Nightmare Before Christmas,” I wasn’t surprised at how well her stormtrooper turned out. 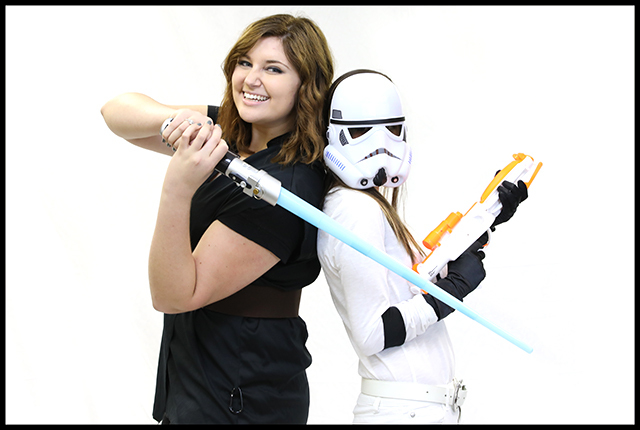 Also, yes, our office is nerdy enough that we had two Star Wars characters — and no, they didn’t coordinate beforehand. “I’ll bet a million dollars you don’t know who that is,” senior writer Susan Shain said to me in a Slack message while explaining her costume. She was right: When it comes to sports, I’m totally out of the loop. Or… goalposts. Or whatever. But Shain pulled off this Michigan Wolverines football coach so well, I feel like I have a sense of his personality. Shain also says the costume could have come together for way less than she ended up spending. For starters, she was supposed to borrow a hat from a friend — but that person turned out to be out of town when we wrote the post. She also only realized the relative expense of the shirt she’d chosen after it had been rung up at Goodwill. It was Loft brand, and was listed on the receipt as “boutique fashion.” Ooh, la la. “I could have gotten the same thing way cheaper at Walmart,” Shain lamented. Plus, lots of you probably already have khakis in your closet… and if you’re enough of a Michigan fan to rock this costume, you might even already have the hat. But since I spent last Halloween with her and I know exactly how epic her DIY dragon costume is, I wasn’t about to let her off that easy. And although it’s pretty darn close to the $30 mark, it’s a heck of a lot more costume than the same amount might buy you in a store. But the story behind the costume is even better than the outrageous getup itself. Van der Hoop’s girlfriend, Hannah, wanted to be the titular Paper Bag Princess from this children’s book for a friend’s Halloween wedding in Las Vegas. According to van der Hoop, Hannah “voluntold” her she would be the dragon to match. But if you’re looking for a quick fix for this weekend, you might want to pick a different idea. Van der Hoop estimates it took her about five hours to put together — which doesn’t seem too long to me, considering its intricacy. … if it came out right at all. I’ve definitely created Pinterest fails working with far less intimidating source material. Leave it to lead developer Branndon Coelho to come up with something totally out-of-the-box and brilliant. Better yet? This simple getup cost less than three of the bills Abe’s portrait graces. After finding, sharpening and printing out Abe’s majestic visage, Coelho used an iron-on transfer to put it on a plain black shirt. He then used a sharp blade to cut out the eyes. He taped cardboard on three sides behind the eye holes, and left a space to slip his phone inside. Then, he downloaded this free app, and voila: Abe came (back) to life. “I went to a superhero-themed birthday party one year,” Comparetto explained. So now, Halloween’s in the bag. My favorite part about this costume — aside from how awesome it looks — is that you can wear almost every piece in other situations. Even if you spend money putting this look together, it wouldn’t be a one-wear waste. And you probably have a lot of the elements in your own closet already anyway. In fact, some folks might even say you should. “This is literally all just stuff that was lying around my house,” said editor Matt Wiley. That’s right: He basically woke up like this. Although Wiley’s paying the price of embarrassment (seriously, not even Halloween makes socks and sandals forgivable), the costume cost his pocket absolutely nothing. Ready to Make Your Own Cheap Halloween Costume? As you can see, you can put together a cheap, clever costume even if DIY isn’t your thing. It’s all about being creative and resourceful — and maybe spending an hour or two at your local thrift store. And if you are the craftsy type, you’ll want to check out these spooky DIY Halloween decorations. Because isn’t gore-ifying your space half the fun? As for me, I’m off to study my own closet and figure out what I can throw together — I sure have some tough acts to follow! Your Turn: Do you DIY your Halloween costume? Show us in the comments! Disclosure: Our friends stopped inviting us over because we were always digging for loose change between their couch cushions. We use affiliate links instead so we still get invited to a few parties — especially on Halloween!